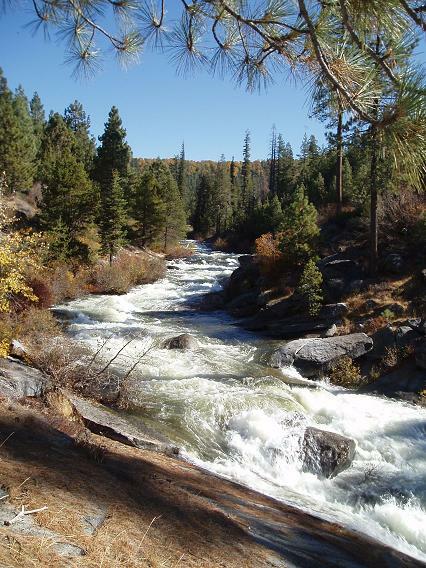 Due to lack of water release from the Ice House Reservoir Dam, this run not only never has water but is generally overlooked as a run in the area. I personally had never heard of the run until a friend called me a year ago when water was last released, to ask me to boat it with him. However that weekend I could not boat. This year however, I was free (kind of) when word came out that there would be a two day only release. So I cancelled my lunch plans and made new ones to kayak. Our main fear was wood. I was told the rapids were class III in nature with a few class IVs dispersed in the run. It is wood that had claimed no less than three boats in last years two week release. With this in mind we set out expecting easy whitewater and horrible wood. Both were partially wrong. 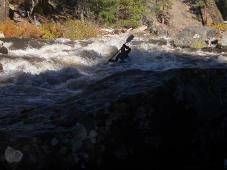 The whitewater is tough in the first gorge (easily IV+), but then indeed lets up. The wood was bad, but not unmanageable as I was led to believe. Over all, the run was fun. Two portages around logs with many skirting of logs that could easily become portages if the log shifts a few feet. Also, apparently logs have moved since last year so each year will be different. 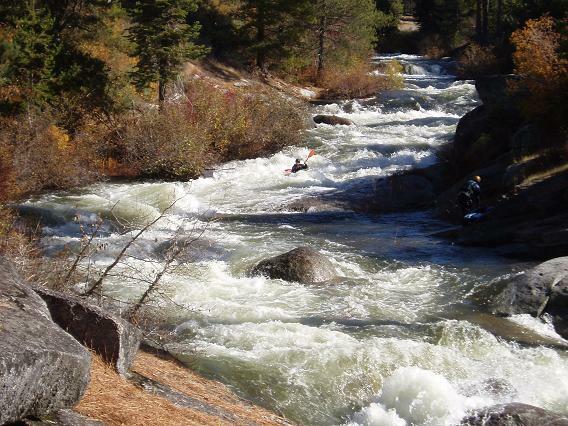 As far as the rapids go, the first gorge has a few big ones, a nice class IV warm up followed by boogie water which then leads to a class III+ and a class IV+. If you want to skip this gorge you will skip the hardest rapid and won’t miss much else; you can do this by putting in at the bridge where Ice House Road crosses the South Silver just past the Bar/Resort. The mile by mile on this is very approximate as the nature of the rapids misleads you to the distance traveled and I have not looked at a topo to figure it all out. 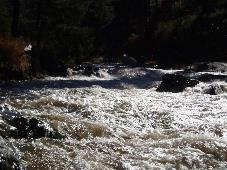 Furthermore, I am only listing the biggest rapids, there are however numerous class III that are not making the list as there were too many to remember and they were all read and run. Put-in (IV). 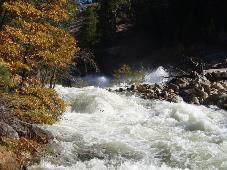 This rapid is immediately below the put-in eddy. The idea is to ferry across the lip of it to the left. At the top on the right the water pushes into a tree. Just below the tree, there is a pour over. Be left of the pour over and head right to avoid being pushed into the bushes on the left bank. Run out is straightforward waves and holes. Dam (IV-). 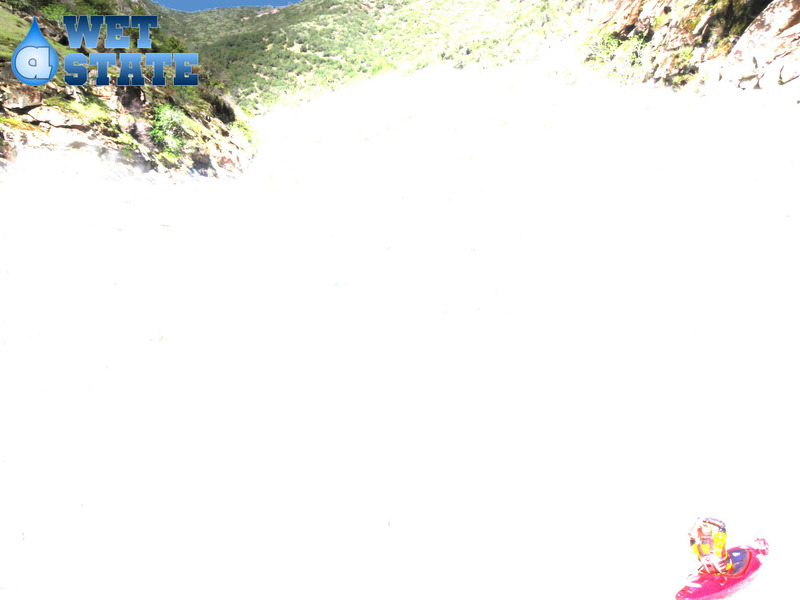 There is a dam that drops four feet or so into a really nasty hole. You will see it coming by the gauge station on the right. Boof off the center where there is a flake next to a bush. Rocks (III). Run down the left or right side of a rock jumble. The left is easier. Hug the shore and ride the slide down. Continue down the next little wave and eddy out on the right to scout the next section. Slide Ending (IV+). This is the hardest rapid on the run. It begins with a slide into a hole. The friendliest side of the hole is center left. Next the river bends slightly. You can go left down the next part but there is a large hole or two you have to go through, and it doesn’t set you up all that well for the final move. If you go right there are a few large curlers to negotiate. The final move is a rock pile which is horrible in the center, desperate on the left, and decent on the right. The line is to paddle up and onto the granite shore on the right. Slide down the granite boofing over the hole at the bottom. 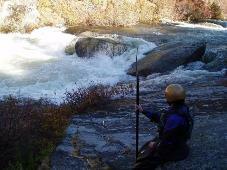 The rapid can also be scouted from the road to put-in. Log (II+). 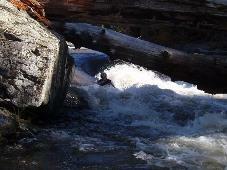 In a run full of class II and III which does this Log rapid make the grade? Because it is a sign that Triple Drop is just around the corner. 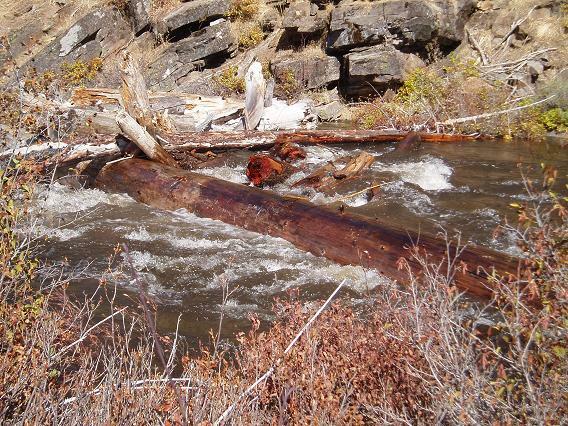 This is the first log spanning the river on the run. There is a sneak on the far right shore. 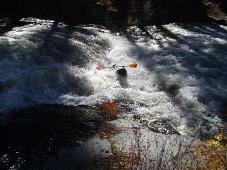 However as I paddled by a new log jammed on it and may shift to close this out, thus requiring a portage. Triple Drop (IV). A series of large drops with the second being the hardest. 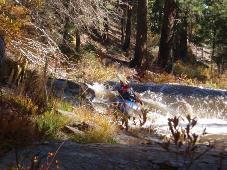 The First Drop (III+) is a straightforward bedrock slide. We took it on the left. 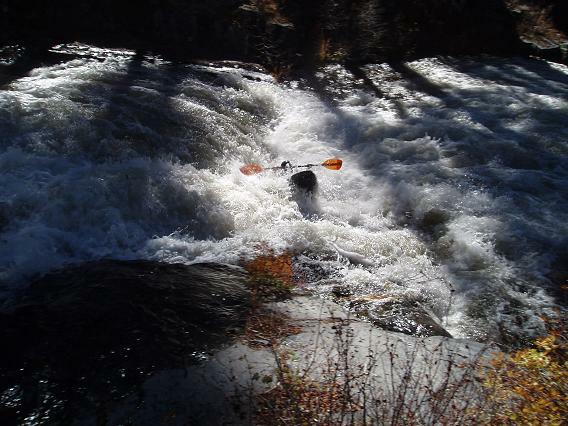 We then immediately eddied out on the right to scout or portage the second drop. The Second Drop (IV) is a three tiered thing. There is a small hole which is hit hugging right and heading right. Work across the cross current and go through another small hole still heading right. Now slide down the bedrock slide and around the hole. If you end up anything other than far right at the bottom, you get beat in a very large hole which has swum many people. The far left side also holds the possibility of a desperation boof, take it too on the shore into the eddy below on the left. The Third Drop (IV-) is another ledge drop/slide. The easiest line is on the left shore. Another line exists on the right shore, both are paddle up and over affairs. The middle however is nastier with a big rooster tail. Tree Portage. On a left turn the river piles into a tree and is unrunnable. Get out on the left to portage. 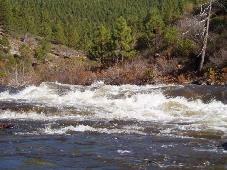 There is another tree one hundred feet down river which must be carried and it may be easiest to portage them together. Slides (III+). A series of slides and holes which we ran down the far right, ending by sliding over granite. Limbo (III+). A steep drop sends you under a spanning tree. The line is to enter on the right heading left. There is a rooster tail to go just right of in the slot. Don’t be too far right as there is a pocket in the wall which could mess you up. If you go too far left, duck. Duck 1 (III+). The move is easy, boof the two foot ledge and stay left to drift under a tree. If you get right at all you get caught in snag branches. Apparently there is a sneak all the way on the right channel. Duck 2 (III-). 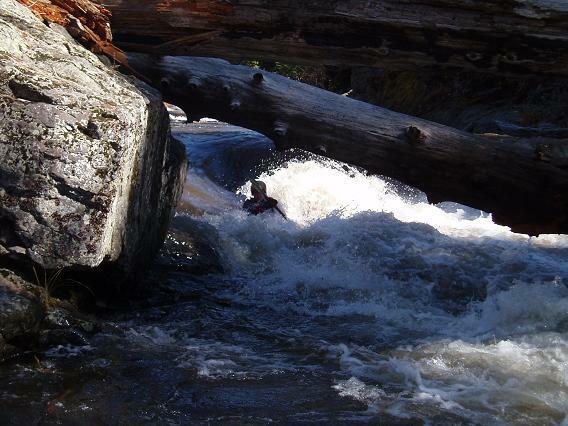 A class II rapid leads into a tree which is spanning just a six inches off the river. 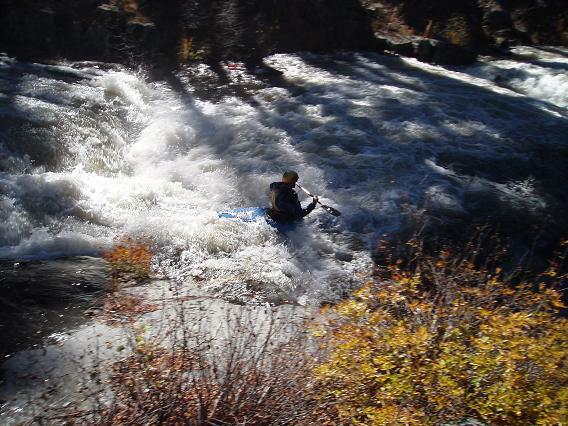 Flip to pass under it (at 500 cfs) and roll up. The let side ends up pushing against the wall a little, so try to stay on the right side of the bank. Tree Portage. After a left turn you have plenty of time to see this log and move left to portage around it. Numerous Logs that you need to be away of. Many are just barely skirted to either side, always eddy out on turns and don’t enter anything you are unsure of. Right Turn Boof (IV-). 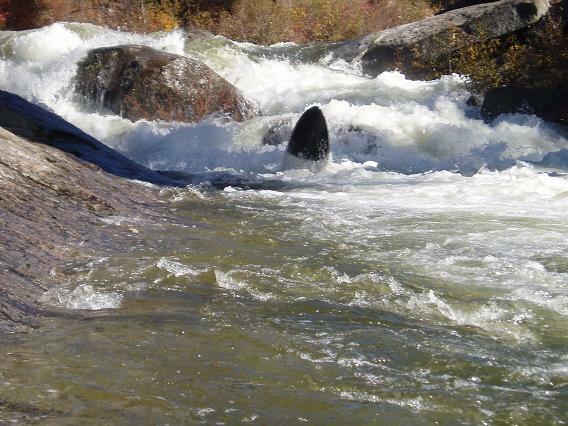 The river makes a sharp left turn. There is a nice landing on the right to scout from. Hug the right shore through the entrance class II. Next enter the lead in hole on the right and hug the right shore. Boof the exit just off the right shore. 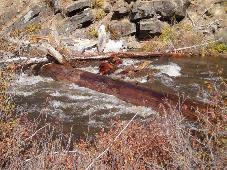 The left side has a steep drop formed by a log. Left Turn Boof (III+). The middle is a nasty hole, avoid at all costs. The left might go as well. The right however has a nice flake about two feet of the shore, hit this and boof down. Cushion (IV-). 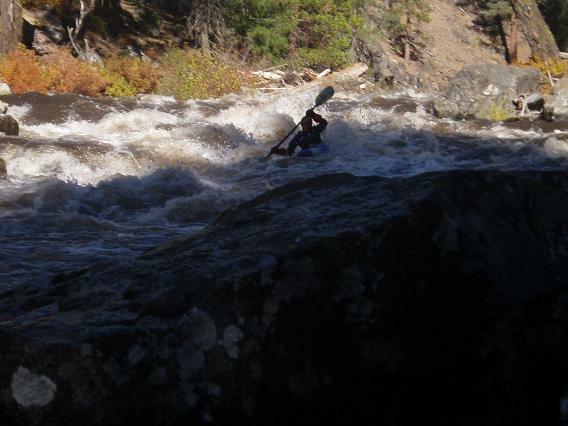 The last rapid very may have been the most fun. 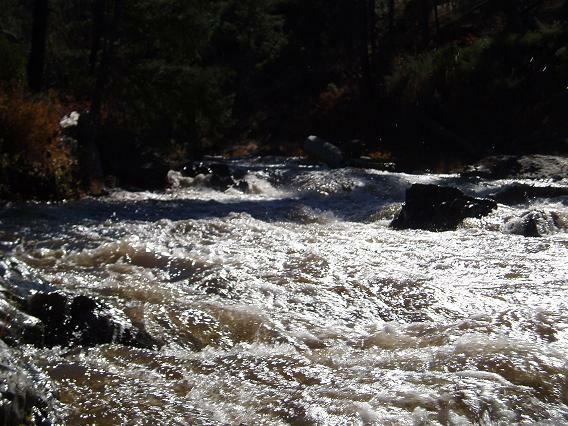 There were big waves and big hydraulics to move you all over in this short rapid. The line is to enter center, go through waves and holes, and then plowing into the cushion coming off the right shore which will throw you to the left side of the river. Look up and you will see the take out bridge fifty feet downriver. Take out: Drive on Highway 50 some 25 miles east of Placerville. Take the Ice House Road turn to the left (also the take out for Kyburz). Ascend for 6 miles till you come to a large Y. Take the left road which is Peavine Ridge Road. Go about 2 miles and turn right at the Y, following road 31. 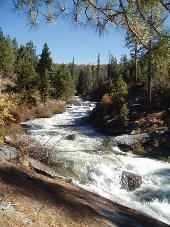 Follow this 2 or 3 miles to the small bridge that crosses the South Silver. 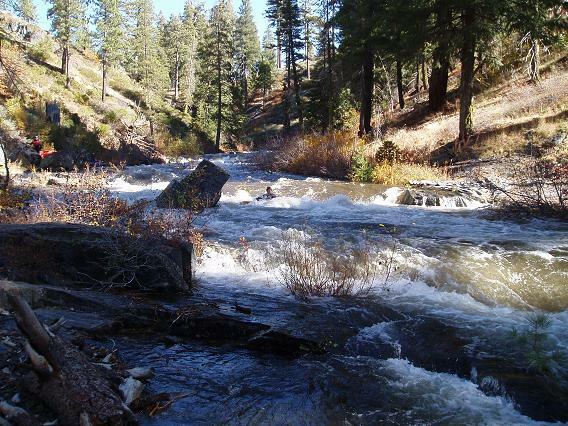 Put in: Return to Ice House Road and turn left, heading away from Highway 50. Go another 4-6 miles until you see the Resort/Bar on your right. This is followed by another bridge crossing the South silver, this is the lower Put-in. To go all the way up, turn right on the dirt road just after the bridge, follow this dirt road about a mile until it reaches the lake and dam parking lot. Taking the dirt road allows you to hope out and scout the hardest section, just drive 100-200 yards and walk down to the water down a granite shelf. Alternativly you can follow signs to Ice House Res. and stay on paved roads, I believe it is the first right after the dirt road (dont quote me though, but it is easy to figure it out).